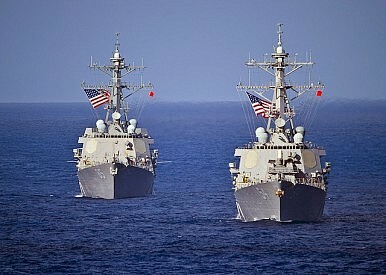 Passage by a cruiser and destroyer follows similar transit in July. U.S. Defense officials confirmed that the Japan-based destroyer USS Curtis Wilbur and the cruiser USS Antietam transited through the Taiwan Strait on Monday. Reuters reported that the transit was being considered by U.S. officials two days before it was conducted. The strait’s width varies between about 70 and 100 nautical miles and China’s and Taiwan’s territorial waters extend 12 nautical miles from their respective coastlines. The water between those territorial claims are considered high seas and not subject to sovereign claims or jurisdiction. Since neither China nor Taiwan make excessive claims over the strait’s high seas the two warship’s passage would not be considered a freedom of navigation operation (FONOP), which the U.S. Navy uses to contest maritime claims that do not conform to the U.N. Convention on the Law of the Sea. A spokesman for the U.S. Pacific Fleet told USNI News that the two ships’ transit through the strait demonstrated the United States’ commitment to a free and open Indo-Pacific and to operate wherever international law allowed. When Chinese and Taiwanese warships transit through the strait they typically remain on their respective side of a center-line midway between the mainland and Taiwan. China’s aircraft carrier the Liaoning made high-profile transits through the strait in January and March of this year. Two other U.S. Japan-based warships, the destroyers Mustin and Benfold, made a similar passage through the strait in July. A spokesperson for China’s Ministry of Foreign Affairs told reporters that China “expressed our concerns” over the transit to the United States and urged it to adhere to the One China principle and not undermine U.S.-China ties or cross-strait stability. That statement’s comparative restraint contrasts with rhetoric from China’s Ministry of Defense condemning a September FONOP conducted by the USS Decatur in the vicinity of Gaven and Johnson Reefs in the South China Sea. A Ministry spokesman said that U.S. Navy FONOPs in the South China Sea pose “grave threat” to China’s security and sovereignty and China “resolutely opposes” them. U.S. officials said the Chinese warship shadowing the Decatur made increasingly aggressive maneuvers towards, eventually closing within 45 yards of the U.S. vessel and forcing it to take actions to prevent a collision. A Pentagon spokesman said there was no indication that the Chinese warship that shadowed the Curtis Wilbur and Antietam on Monday conducted any unsafe or unprofessional maneuvers. The transit comes days after U.S. Secretary of Defense James Mattis met with his Chinese counterpart, Wei Fenghei, at a meeting of ASEAN defense ministers in Singapore last week. In their meeting Mattis reiterated the United States’ opposition to activities like China’s militarization of disputed islands in the South China Sea, but expressed hope that the relationship between the two militaries could also be a source of stability amid rising tensions.